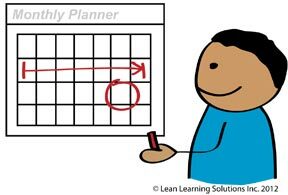 A lot of people ask me about applying Lean in non-manufacturing areas. Quite often they can see how Lean would apply in manufacturing but not how you would apply it in administrative areas. Here’s an example of applying Lean to a Project Management Office. A little background. Almost without fail I hear the same words when I visit an operation that has begun their Lean journey. They are busy making improvements to the current value stream only to receive a setback when they have to introduce a new product or a new piece of equipment. Typically these projects are late, over budget and fail to meet the needs of the Customer including the needs of Manufacturing who is one of the customers of design. To make matters worse, when the project budget runs out, all help disappears and the Manufacturing team is left to complete the de-bug themselves. All too often I hear “it’s in the computer” but just because it’s in the computer doesn’t mean it’s visible to all. In fact, if people don’t go look for the data in the computer, it’s visible to no one. Without making the project status and problems visible, things keep going until it’s too late. Then everything becomes a mad rush to completion. A project is a plan and we know that nothing goes completely according to plan. Thus the need to rely on a strong Check/ Adjust process to catch problems early and problem solve to get back to plan. Try this, make the status of projects visible and have frequent, short project review meetings. Not detailed design reviews, rather a status review. If all is OK, the status is green and keeps going. If anything is off target, the status is red and problem solving is launched. Problems are caught early and worked on before they become big boulders. As teams get better at making project status visible, they begin to make the status of their problem solving visible. By making the project timeline visible, teams can find waste in the design process and work to eliminate that. Since much of the waste occurs at organizational boundaries, teams then work on ways to reduce waste in the organization. Obeya rooms or large project team rooms where the current state is visible to all are one possible countermeasure. Much improvement is possible but teams need to be able to visualize the waste in the process before they can engage in making the process better. Try it, I’d love to know how you made out.